The picture above contains a popular brand of carbonated soft drink. Well, it’s also of my desk earlier today, and the door to my office. And a window showing sunlight and the outside world where I would have preferred to be at 3 PM today. That’s not to suggest that I don’t thoroughly enjoy my job and instead feel that each passing moment in that chair is crushing my soul like a pus-covered sewer troll, because nothing would be further from the truth. I very much enjoy my work, and my soul is quite free of dead weight supplied by oozing supernatural critters, thankyouverymuch. That said, at 3 PM on Friday, it’s pretty much a given that everyone who is not a six-eyed, 14-handed, work-devouring accomplishment beast with magma breath wants the weekend to get started. As I waited this afternoon, as patiently as possible (i.e., like a toddler who’s expecting a long-promised a trip to the toy store for new bubbles) for those glorious, precious, not-going-to-be-responsible-for-two-whole-days hours to get underway, I realized I was somewhat parched. And not only that, but, more specifically, craving a certain beverage. And, surprisingly, no, not the one made with malted barley and hops. That one pictured in the green bottle above. Now, make no mistake. I do not consume this particular beverage often. Back in my younger days, when I was a crazy twentysomething with a bit of a bad-boy streak and a devil-may-care attitude*, I would toss 20 oz bottles of the stuff back like it was yellow-tinted liquid gold. Err…maybe bringing yellow liquids into this doesn’t paint the right mental image. Anyway. As I’ve gotten older—and theoretically wiser—I’ve tried to curb habits that aren’t necessarily recognized by science as part of a reasonably healthful lifestyle. I’ve stopped main-lining buffalo wings, I no longer look at an all-you-can-eat taco bar as a challenge, and, may the gods of the ancient Mushroom People help me, I’ve even started thinking about my fiber intake. Likewise, I try to limit my consumption of corporate carbonated soft drinks because, as far as I can tell, they’re basically a mixture of unpronounceable chemicals capable of turning your brain into a molded jello filled with orange slices**. Every once in a great while, though, I get an urge. A Friday afternoon hankering for a taste of fond memories of my youth. Sure, it’s not exactly on the Mayo Clinic’s list of super foods, but, dammit, there’s more to life than hiding from the world in your bed with nothing but celery, kale, and dry oatmeal. 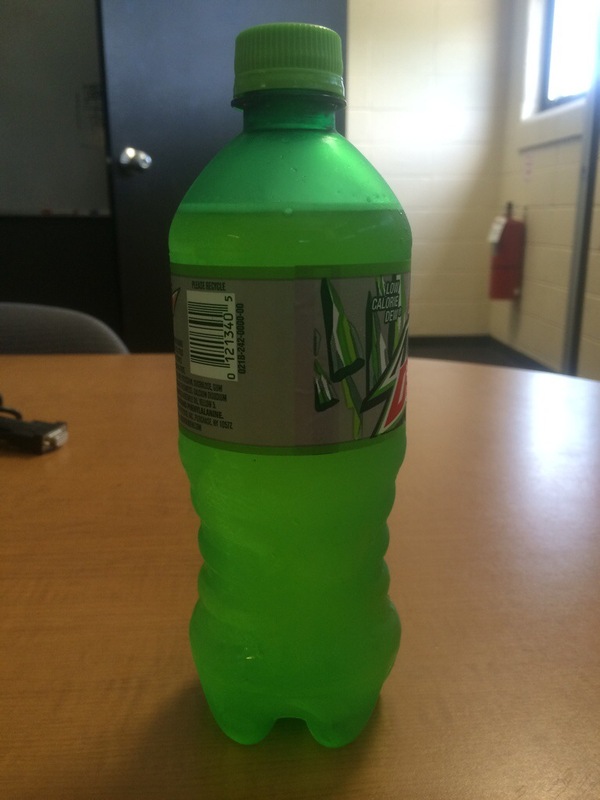 So this afternoon I went to the vending machine, offered up a sacrifice of quarters, and received a cold green bottle that brought a smile to my face, however briefly. It’s not something that’s really all that good for me, but for a little bit of time, it made me happy nonetheless. And that, if nothing else, is a good piece of advice for what to do with your weekend from time to time. Get out and go a little crazy. Do some stuff that’s maybe a little scary, and possibly even not that healthy in the long run. Have a good time doing it anyway. Because, if nothing else, I’m pretty sure the weekend was made for cannonballing, sky diving, or just eating ice cream straight from the carton. And not even feeling bad about it. After all, this is your only shot at Life, puddintopians, no reason to live it like you’re just wanting for the Grim Reaper to come and get it over with. Now go get a bottle of something for yourself and have a great weekend while you’re at it. *The author would like to fully retract the suggestion he’s ever had either a “a bit of a bad-boy streak” or a “devil-may-care attitude”. **The basis for the fruited jello mold assertion is scientifically inconclusive.